Welcome to New York State Parks and Historic Sites. It is our mission to provide safe and enjoyable recreational and interpretive opportunities for all visitors in recognition of individual needs and interests. Universal Access in New York State Parks means providing recreation opportunities for everyone regardless of differences in ability. Accessibility improvements invite families with children in strollers and people with mobility issues to our state lands. 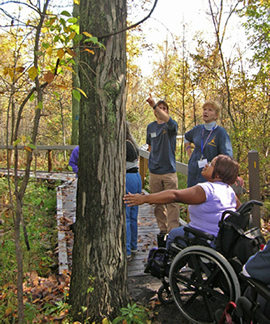 Various auxiliary aids and services are available to include people with sensory or cognitive differences in park programs. The Office of Parks, Recreation and Historic Preservation welcomes all visitors to explore outdoor recreation on state lands, and we are committed to providing an ever-increasing range of inclusive, accessible opportunities. Given the vast size and scope of the New York State Park system, expanding accessible opportunities at Parks is an evolving and ongoing project. As we increasingly make our facilities and programs more accessible, information will continue to be made readily available at our facilities, in publications and informational materials, and on this website. We encourage you to visit the "Amenities and Activities" sections of each park or site page to find the latest accessibility information for that facility. We also strongly recommend that you contact the facility in advance of your visit to understand what you can expect and how best to make your experience positive. If you require an accommodation, we welcome you to contact the Facility Manager of the park or historic site you plan to visit. For information about the Access Pass program for New Yorkers with certain permanent disabilities visit Access Pass or call 518-474-2324 or the New York Relay system at 711 for TTY or VCO users. The New York State Office of Parks, Recreation and Historic Preservation (OPRHP) is working to provide access to all web site content, services, and transactions to persons with disabilities to the greatest extent possible. Any person with a disability who is unable to access any content within this site is strongly encouraged to report the problem to the contact listed below, both so that we can assist in obtaining the information you need and so that, if possible, we can fix the problem for other users. For general questions, suggestions and comments about accessibility in New York State Parks and Historic Sites please use the contact information below. Access Pass Program - Permits New York State residents with disabilities free or discounted use of facilities operated by the New York State Office of Parks, Recreation and Historic Preservation and the New York State Department of Environmental Conservation.